TravelSkite: A Trim little cat? 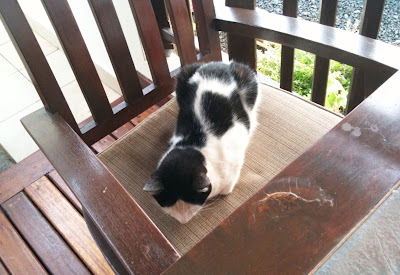 One of the hotel cats was on my balcony this morning. As there are cane fields all around there are, inevitably, rats, so the cats are on the staff (the introduced mongooses evidently think they've done their dash getting rid of the snakes). My visitor has similar colouring to Matthew Flinders' cat Trim, who sailed all round Australia with him and sadly disappeared while MF was imprisoned here in 1803 for six and a half years, because France and England were at war and he was suspected of being a spy. Trim is famous: there are actual statues. It would be nice to think I encountered some of his genes this morning.